No one knew what was bothering 7-month-old Mya Whittington. Her discomfort stumped her parents and doctors. She was finally hospitalized - and a 2-inch feather eventually poked its way out of her neck, shocking everyone. "We were just pretty much in disbelief," Mya's dad, Aaron Whittington, 26, told ABCNews.com. The mystery of Mya's pain started on Saturday. "I was at work and my wife noticed that the left side of her neck had started to swell, and she called me at work and asked if we should take her to the emergency room," Whittington said. The couple decided to wait, thinking that Mya just had a swollen gland. They changed their minds the next morning. "Sunday morning, when we woke up, it had doubled in size and there was a pimple-looking thing on the end of it," he said. "We're looking at it and going, 'There's no way this is a swollen gland.'" Mya was admitted to a hospital near the family's home in Hutchinson, Kansas. Doctors thought she had a staph infection of her lymph nodes. But when they tried to drain the bump, nothing came out. 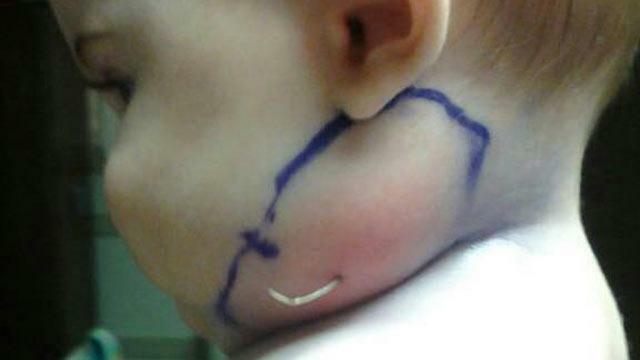 Hours later, Aaron Whittington and his wife Emma noticed what appeared to be a "half-inch string" protruding from Mya's face. "[The pediatrician] threw on gloves and she pulled out a 2-inch feather and she's like, 'It's a feather.' And we're like, 'What do you mean it's a feather?' And she showed us," Whittington said, still in disbelief. "As far as how the feather got into the side of the neck, our doctor says we'll probably never really know," he said. "But her best guess is that she either inhaled it or tried swallowing it and it got lodged in the throat somewhere, and the body, just being crazy, just started to reject it and force it out the side of her neck." The parents now remember Mya crying and puling at the area under her left ear over the past few weeks, but they thought she might be getting an ear infection or teething. The little girl is now "almost 100 percent recovered," according to Whittington. Doctors have checked her out and determined that she will not need surgery. They say her body will heal on its own. The Whittingtons say they are grateful for Mya's health and have been shocked that the story has gone global. "We've been extremely, extremely surprised," Aaron Whittington said. "We've gotten stories in Kenya, India, the U.K. It's really crazy."